See sign ups below for our New Season of events! 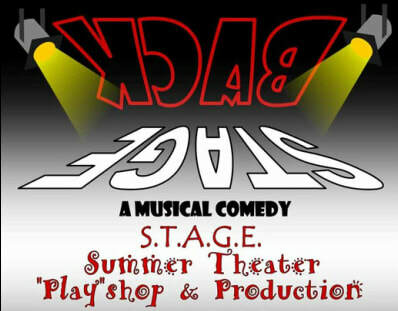 Scroll down to learn more about our Summer Musical, Backstage!! ​ To simplify the financial side of our program, we are now offering tuition packages. *Summer packages also include: A t-shirt and meals during the final week of rehearsals. What does the One Day Camp schedule look like? 9:30: Registration and sign in will take place beginning at 9:30 am in St. Teresa's basement. Parents or guardians must sign their child "in" and leave emergency phone numbers and information. *We will begin with some ice-breaker games and warm ups. Noon: Lunch and Breaktime (you will need to provide a sack lunch). 2:15-3:00 Rehearse and prep for performance. 3:00 Parents and family members may arrive to see our short presentation. * Wear comfortable and modest clothing. Basement tends to be on the cool side, so long sleeves or a hoodie are recommended. Stage will provide a few costumes for improv as needed. How do I register and pay for the camp? ​Please send your check and registration to Lee Hotovy at 6500 Carlsbad Drive, Lincoln, 68510 by October 1/April 15. S.T.A.G.E. crews! If you like the idea of learning about another aspect of theater and helping out behind the scenes, then consider joining one of our S.T.A.G.E. Crew Teams. We are now offering crew spots in Backstage; Hair and Makeup; Cast Crew; House Crew. Fill out an application below and mail to the above address. You must be in 7th grade or older and applications will be reviewed before you are accepted into the program. Please see registration form below by hitting orange button link. TUITION payments for Art, Theater, or Creative Writing may be made here. If paying for more than one class, you must go through the process more than once. $1.00 Surcharge per payment. **PLEASE SELECT YOUR MUSIC CHOICE BELOW (DON'T FORGET TO DOWNLOAD LYRICS FOR SEIZE THE DAY AND LITTLE PEOPLE)WE WILL HAVE AN ACCOMPANIST AVAILABLE FOR YOUR AUDITION. WHAT ARE THE BENEFITS OF STAGE AND WHAT MAKES IT DIFFERENT THAN OTHER THEATER EXPERIENCES? The main mission of STAGE is to use the medium of theater (and the arts) to teach about God and the message of love. It is based on the Call to Artists by John Paul II. Our theater team of professional adults, work with this philosophy in order to give the students a full experience of learning about theater, dance, and music, while having the fun of expressing it to others. It gives them an opportunity to hone their art, develop confidence, experience their faith in a lively and productive way, and learn about teamwork in a positive environment that focuses on Godly virtues. S.T.A.G.E. makes every effort to produce a high quality show with superb music and choreography, great costumes, and colorful sets with creative lighting and sound. We pride ourselves on thinking outside the theater box at times, to give the audience a fresh taste of live performance, especially with kids! With over fifteen years under our belt, the STAGE team is committed to providing each student with one on one time to learn their part, along with many group activities to give them a fun, social experience throughout the four weeks, all in the Spirit of S.T.A.G.E.! Come join the fun this summer and be a part of S.T.A.G.E.! taste of the art if it is new to them. This camp will be presented by Mrs. Hotovy along with student assistants. When is the registration and tuition due? Classes will be filled in a first-come basis and class sizes are limited. Registrations are due three days prior to camp date. What will my child get out of the camp? Students will learn the basics of theater within the theme of the camp. How should my child dress and what should they bring? Comfortable and modest clothing for movement and fun. Tennis shoes or jazz/dance shoes if you have them preferred. Students should provide their own sack lunch or snack for break mid-way through the camp, along with water bottles. We will provide costumes for the presentation. Sign ups are now open! See monologues below and music selections on the left column. HOW SHOULD I PREPARE FOR MY AUDITION FOR THE SUMMER PRODUCTION? Audition dates: April 25-28/use sign up genius listed (see button below) for a time slot. It is recommended students present themselves first (ie: “Hello, my name is……and I will be presenting….”). It is also recommended that they have their pieces memorized and feel confident in their presentation. We will have them read from segments of the play as well. The entire audition should last around 12 minutes. In addition, a dance audition will be held on Sunday April 28 from 3-4:30pm at St. Teresa's K-Hall. Callbacks will follow on Sunday evening from 5-8pm as needed. You will be emailed if you make callbacks on Saturday evening. *Following Casting decisions, a meeting for parents and participants will take place (Wednesday May 1 at 6:30pm) to lay out details and expectations of production. Tuition forms and contracts will be available at this meeting. Rehearsals take place during the month of May at St. Teresa's (Friday evenings); we then switch to Pius May 30th and hold rehearsals through the month of June (M-F) from 5:00-9:00. Cast members will attend some, but not all of these rehearsals in the first two weeks or it will be broken into time slots (Ie: ensemble 5-7pm; main characters 7-9pm). Any schedule conflicts need to be listed on audition forms (this would include sports, camps, or work conflicts). These will be taken into account when we cast. Performance dates are June 20-22 and June 28-30. If you have questions, please contact Lee Hotovy at shotovy@msn.com. *Partial scholarships are available for those with financial needs. Registrations and Scholarship forms will be provided at auditions. No fees will be needed until casting is complete. Scholarships will be announced following casting. Somewhere on Broadway there exists a backstage. Here the crew members must figure out how to keep the show running, even though props are missing and things are falling apart! Before long, crew members must perform on stage or else! The show is creatively staged with the audience watching the backstage area of the show, while the performers are seen through a scrim performing for another audience. Parts of famous musicals (West Side, Les Mis, Phantom, Annie, Newsies, Music Man) are used throughout the show. CAST PARTS**: Adult characters will be played by high school aged performers (15 and up). Crew (12-15 years) and child parts will be played by students 9-12 years. **Please note, these are suggested ages...we will adjust as needed per auditions. Ready to Audition?? Hit the button for a sign-up slot! ​Find photos and download for your very own! S.T.A.G.E. password required.